I have a problem with utilization of disposed stateful sessions. It seems that knowledge base keeps references on stateful sessions despite of it was removed by calling dispose() method. In result garbage collector can not release resources. I can assure you that there are no known memory leaks in Drools, especially something what is as core of functionality as session management. Please debug your code some more, as the problem lies there. After debugging, if you have concrete questions/info then please post them. Here we simply create 500 stateless sessions and insert in each "heavy" object (list of 1000 dates). 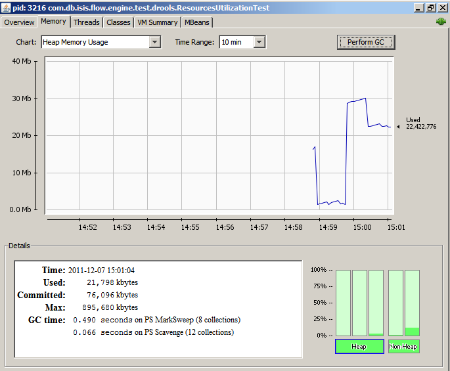 As you can see java process consumes ~3Mb before and 22Mb after invoiking sessions. 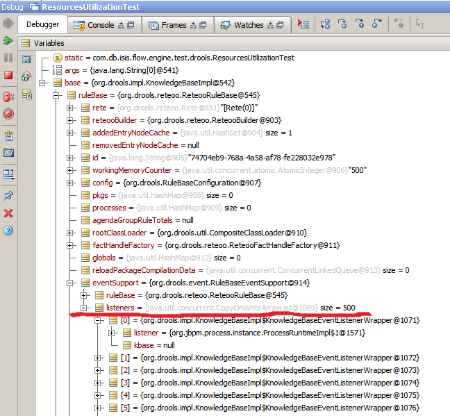 You can see that knowledge base keeps 500 references to ProcessRuntime objects. The picture is the same when we using statefull sessions and dispose them by dispose() method. Your sample code uses stateless sessions, not stateful, so not sure where dispose applies here. Stateless sessions are fire-and-forget. So once you execute it, you should set it to null in your example, otherwise yes the reference to it will keep existing. It won't change anything if you set variable "session" to null because it's visibility scope is limited by for operator. 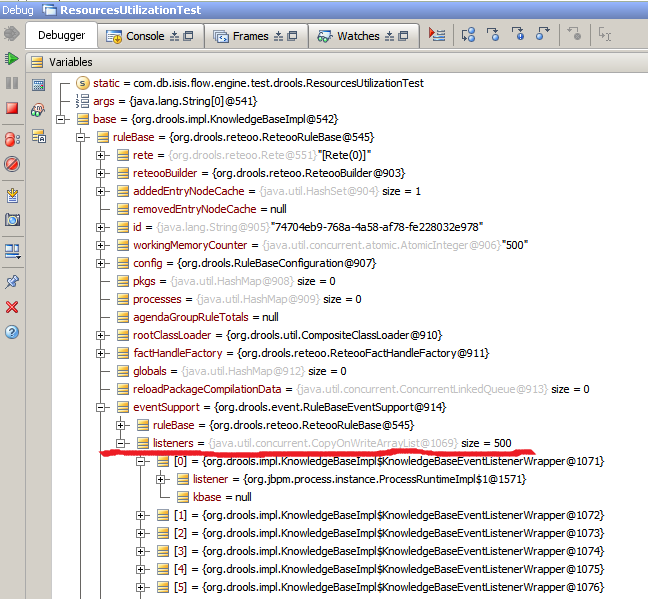 And if you look at screenshot you will see that garbage collecter can't free session memory because KnoledgeBase is referencing those sessions, not Main method.